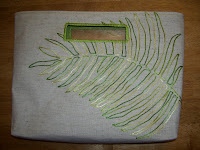 In about half an hour, I turned this placemat into a fantastic little bag. I followed Spool's great tutorial for making a bag out a placemat. It was really fast and easy. 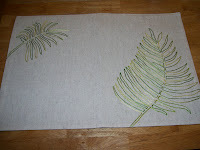 I had been hoping to find a good placemat for this project and this one was all alone on a clearance table. The nice thing about placemats is that they usually have well-coordinated patterns and colors.